It's a cold, lazy day so let's try a random Greyhawk topic. Feel free to comment or add to this list. This is a list of ten World of Greyhawk locations that I personally have never used in a campaign (but probably should someday). Some are pretty obscure so you'll have to figure out what and where these places are on your own. If you have used one of these places before then kudos to you, let me know how it turned out! Wow, I've been slacking here. Today I'd like to spotlight pages twenty-six and twenty-seven of our Castle Greyhawk graphic novel. As always head to the links above where you can get extra exposition from author Scott Casper. Or you can view these pages as well here and here, compliments of Maldin's Greyhawk. Artist's Commentary: Page twenty six almost didn't make the cut. We were concerned with how dark of a story we wanted here, and well, killing defenseless kobolds is part of D&D. In retrospect it was a wise decision and it's fun to see young Tenser struggling like a rookie. The sequential panels of Tenser is a method I employed often in my previous Greyhawk comic and I'm pleased with the hilariously gory results here. Just a quick post today to reflect on all that's going on. I must say, it's a good time for old school D&D! We got Gygax Magazine releasing this week, we got Wizards of the Coast re-releasing their PDFs of which the best selling are the classics, and badge registration starts for Gencon Indy 2013 on Sunday. I expect this year will be a banner year for the old school crowd at Gencon what with the new magazine and D&D's 180 toward revisiting classic D&D products. Be it PDFs or reprints of classic hardbacks or creating a new edition that harkens back (or tries) to the earlier versions of D&D, I haven't been this jazzed about D&D news since Pathfinder first came out. Beyond all this, it's full steam ahead on Greyhawk community material as usual. And who knows? Maybe our fanbase will once again have a day in the sun someday soon. After 300 years of existence the Great Kingdom is at its height. From the Solnor Ocean in the east all the way to the Yatils in the west and from Sunndi in the south to the marches in the north such as Blackmoor. The kingdom has become vast and hard to keep together without adventuresome knights. There is plenty of old hostilities and new ones in the making. 203 CY sees the powerful Knight Protectors of the Great Kingdom shaken by the treachery of Sir Kargoth and his thirteen knightly conspirators. They become the first death knights. 213 CY is the official start of Aerdy's decline, the so-called "Age of Great Sorrow" where Aerdian rule becomes weak regarding its outer dependencies. This sets up the drama to unfold for any campaign centered on knighthoods and nobility. Over the next 40-150 years the Great Kingdom begins to chip away starting with the far away Viceroyalty of Ferrond which eventually splits off in 254 CY. Here is the home of the Knights of the Hart (Furyondy, Veluna and Highfolk) who will later see the Kingdom of Keoland's Knights of the Watch inch up on their borders. Another more contemporary rival to the Hart however is the Knights of Holy Shielding whose lands lay between Ferrond (later Furyondy) and the rest of the kingdom in the east. As you can see from the map below (by Kwint from the Canonfire forums) this is almost the same Flanaess we're used to except it is from a time before the rise of Iuz in the north and the revelation of the Scarlet Brotherhood in the south. The centrally located Greyhawk City is also here albeit as a smaller mining-trade town, not yet free of the Aerdy. It is also a time before the creation of Castle Greyhawk, but there is still many more ancient adventure sites in abundance. The red areas show the scope of the campaign, where knights have to travel long distances to administer their laws, attend court, participate in tourneys or push the frontiers of the kingdom farther. Divide player character knights between different orders and across this extensive area and the intrigue is only heightened. I will be sure to discuss more on this subject in the future. And....we're back! 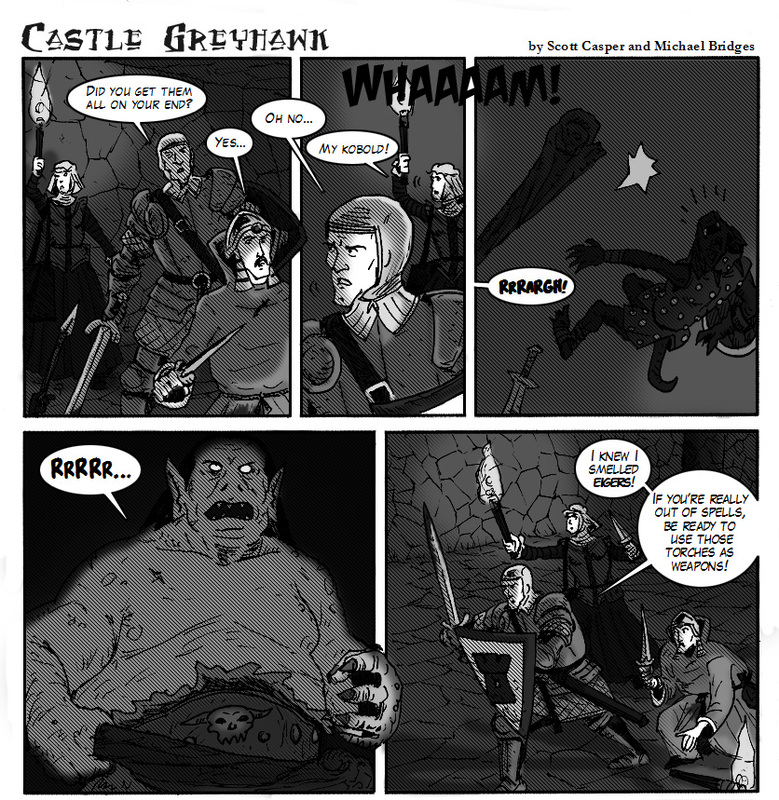 Page twenty-five of our Castle Greyhawk graphic novel is finally here after a short hiatus over the holidays. Follow the link to read the entire story from the beginning where you can get additional plot points by series author Scott Casper. Artist's Commentary: More kobold action! There was some fun things going on in this episode. The wyvern emblem on the lead kobold's shield, more floating magic script, alot of alternating negative space and my favorite part the dynamic movement between panels by Yrag. Slicing that javelin out of mid-air reminded me of the Aragorn-Uruk-Hai fight scene in the Fellowship of the Ring movie. The orc throws a dagger at Aragorn and he hits that dagger out of mid-air with his sword. So cool. This rare contest was pointed out to me by Scott Casper. Black and white illustration? Greyhawk themed? Winner published in the reprint of Against the Slave Lords? Welcome back Greyhawkers. 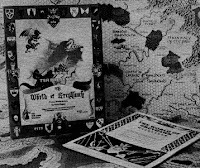 Today I'm catching up on promoting Braggi's extensive map and reference downloads entitled The Greyhawk Adventurer's Atlas. Follow the link above to his previous installments and appendices. Here is what has been in the offering over at Canonfire for the last few weeks. Enjoy! Examined herein are the northern Abbor Alz, the Bright Desert, the Wild Caost and the Pomarj Peninsula. In this installment the Vale of the Mage, the Grand Duchy of Geoff, the Earldom of Sterich the Yeomanry and the Sea Princes are examined. Examined herein are the March of Bissel, the Gran March, the Kingdom of Keoland and the County, Duchy and Principality of Ulek. Two Wizards article posts in a row from me? I'm starting to feel like a WotC lackey or something. Anyhoo, The Dungeon Master Experience is a column by Chris Perkins and it caught my attention so I had to weigh in here. Unflappable asks the question, what one word best describes your DMing style? Chris' unflappable style elaborates on some of his pet peeves at the game table and how he copes with them. I tend to agree with his views. What one word best describes my DMing style? Relentless. Alot can go on at the table to slow you down; late starts, distractions, criticisms, repetition, etc. These things can be discouraging for some gamemasters. I always know however, that if I can power through the first couple of months, the campaign will gain traction eventually and every one of my players will be on the same page. Then, three to four months later, they'll be fully invested in my story enough to care what happens to their characters and see it through to the end. Once that story arc is completed, the campaign and characters have now solidified in our collective consciousness and take on a life of their own. We still talk about characters and adventures from many years past like they were still actively going on and once in a great while they do get revisited. That sort of gameplay only comes with being a relentless DM. Not surprisingly, I credit the World of Greyhawk setting in part for my relentless attitude. It has proven to me that this is a setting which refuses to go away. Though newer and more fancy D&D worlds come along occasionally, Greyhawk churns on for decades and yet never ceases to run out of space for me to start a new story. I am relentless with the setting because I know in the long run the players will remember their time spent there more than if I chose a random game to do a one-off campaign. I am not putting down other settings or even RPGs (Lately I have got the same results with Mutants & Masterminds), I am just saying sometimes you need to stick with one for an extended period in order to develop that kind of lasting, shared experience with your players. And if you do, it'll make all the headaches of DMing worth it in the end. 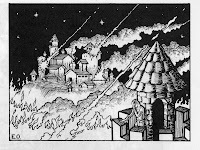 It's a light day and there is no big Greyhawk news, so I scoured the Wizards site for anything interesting and behold, an article by Mike Mearls was posted yesterday titled D&D Next Goals Part 1. Last year I was initially buzzing about this newly planned edition, and I eagerly read the first playtest packet Wizards released, but since Gencon 2012 and the announcement of more playtesting till 2014 (rightly so), my mood has mellowed to an almost apathetic level. Despite further playtest packets since then, 2012 was rife with these type of filler articles talking vaguely about design theories and whatnot. My hope is that 2013 isn't more of the same. I get it mind you. I know Mearls and company are just trying to keep interest up for another year, but I'm not the playtester type, so at this point I'm thinking of avoiding spoilers. Like a blockbuster movie, I've read the press releases, I've seen the trailers, now I'm going to try and patiently wait till the finished product comes out. My work on our Castle Greyhawk graphic novel has unfortunately been stalled for the last couple of weeks due to a dead laptop during the holidays. Until I'm back in business, I've been borrowing a different computer to keep up with things. Today I'm going to fill this hole in my Greyhawkery schedule by replaying an old Greyhawk comic favorite of mine from 2007. The topic was Waldorf, a funny but memorable character from Dragon Magazine's letters pages wayyyy back in 1988. Enjoy! 2012: Maintain 2-3 posts a week on Greyhawkery and once a week on the Canonfire! Crier. 2013: Keep up the same pace, find other contributors/s for the Crier. Greyhawkery is still humming along nicely. Finding content is sometimes hard but I manage to find something noteworthy every so often. My plans to expand the roster of Ring of Five Questions interviews at Gencon stumbled a bit. I got a few people to respond, but my emails were totally snubbed for the second straight year, by all the Paizo folks who I talked to. Either the staff at Paizo is really too busy being successful with Pathfinder to reply or there is an internal memo to stay away from Greyhawk now. I hope I'm just being paranoid. Either way, I may have to branch more into the fan community for authors to interview. More at a later date. The Crier is a tough one to maintain. As I already cover everything at Greyhawkery, the Crier ends up redundant to me. If I could get one or two fresh minds to post on that blog for Canonfire, I'd be happy. I keep saying this every year. I had of course wanted to publish my finished Ulakand article and start on a Kester follow up. Both projects are still in limbo, but no more than the undead-zine that is Oerth Journal. I did manage to run a successful Postfest at Canonfire involving taverns and inns. Mine was the Last Respite, set on the Olman Isles. A decent victory there. My last article pipe dream however is to start on my Battles of Greyhawk series. I have the research and ground work done, it's just format and actual writing that I can't get motivated to do right now. Eh. Easy one there. 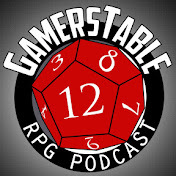 Last year my friends started the Gamerstable podcast and so far I've defended the honor of Greyhawk on numerous occasions and I've even ran a few actual play podcasts of my Sea Princes campaign. So far so good. Beyond that, I've been encouraging anyone who starts a Greyhawk blog, fiction, maps, anything. The community is strong as ever. 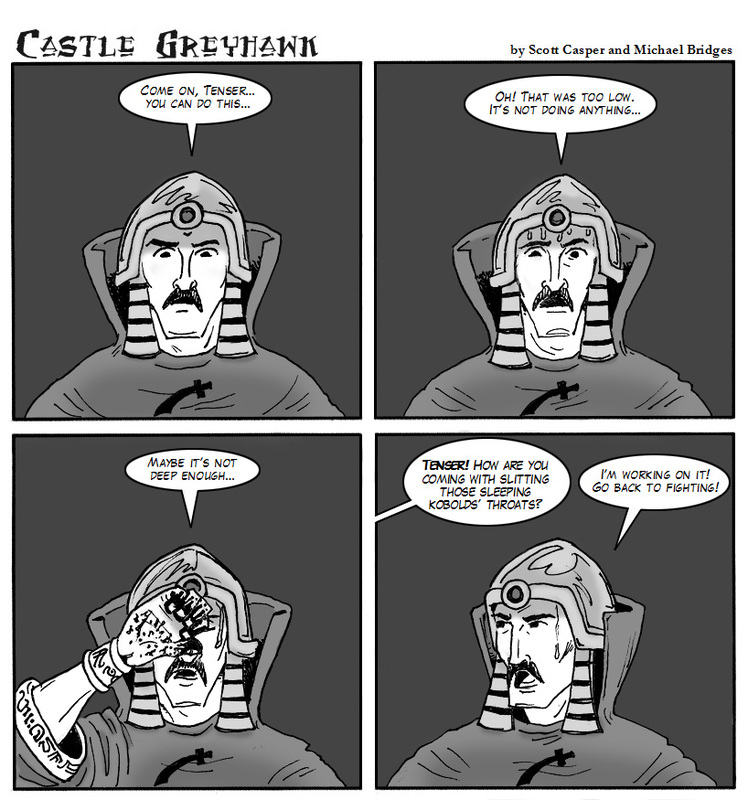 2012: Redesign the Greyhawk Comic page. 2013: Continue making Castle Greyhawk graphic novel. I have indeed not made a new comic strip for the old Greyhawk Comic in a year, that mine is played out. It does live on at Melkot.com though. Thanks as always Denis! Recently however I found my muse in Scott Casper and his Castle Greyhawk fiction. We put our noggins together and have now crafted an amazing comic adaptation of Castle Greyhawk that has turned out to be some of my best art ever. Now over twenty-four pages in, I look forward to whatever direction Scott leads us. Last year saw some amazing Greyhawk maps and none of them by me. I have a feeling however, once Anna Meyer gets to finishing Ull and the Hold of the Sea Princes for her Greyhawk Atlas, I may have to branch out and see what else I can contribute, especially if it is something I can do in conjunction with the Ull series or my continuing Sea Princes campaign. Sea exploration is good motivation for map-making. New for 2013: Get more Greyhawk fans to come to Gencon. Last year was a hoot. I did manage to meet more than a few people from the Canonfire community at Indianapolis. Help me make sure this year is even more memorable.